I am only guessing, but I think that this little shell is a Florida Rock Snail (Stramonita haemastoma). Because it has a pretty orange color inside and horizontal stripes, I think my guess is correct. It measures 1 1/8 inches in length. I picked it up on Sanibel Island many years ago. I’ve always thought that some of the prettiest seashells are the smaller ones. Everyone seems to be looking to collect big, fancy shells, but look closer – tiny is sometimes just as fun to find. I miss the beaches of Florida, but I may be living back down that way soon. With walks along the beach in mind, I plan to keep my eyes open for some fun treasures to collect. I won’t be living on expensive, high class Sanibel Island, so I won’t have piles of shells to dig through. On the east coast shells are not nearly as abundant. And that is why finding them is so darn fun. Not many people can afford to live on the beach, but living close enough to make a short drive there is good enough. And living in the state of Florida means there will be a good variety of beaches to visit, and waterways to travel. I see a nice boat in my future! 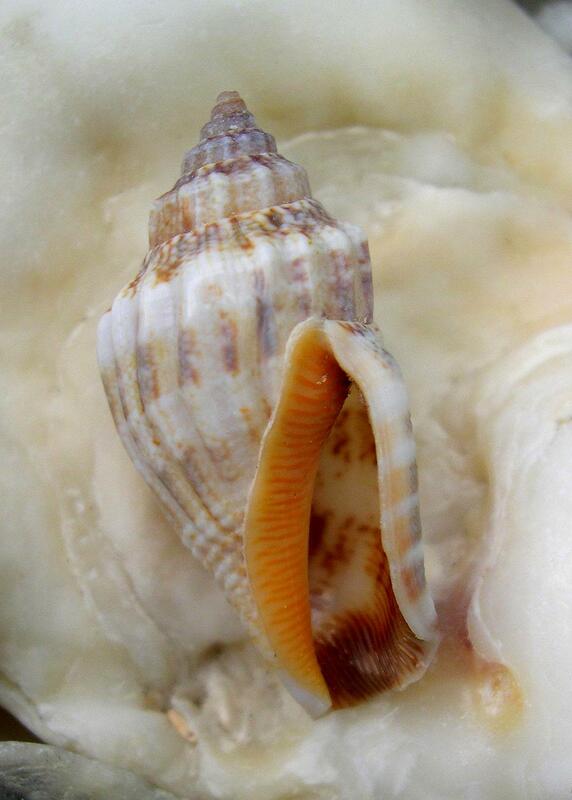 If you know what this shell is called, and it’s not a rock snail, please leave your comment below. Thanks for reading!